"Tammany" redirects here. For other uses, see Tammany (disambiguation). Tamanend or Tammany or Tammamend, the "affable",  (c. 1625–c. 1701) was a chief of one of the clans that made up the Lenni-Lenape nation in the Delaware Valley at the time Philadelphia was established. Tamanend is best known as a lover of peace and friendship who played a prominent role in developing amicable relations among the Lenape and the English settlers who settled Pennsylvania, led by William Penn. Also referred to as "Tammany", he became a popular figure in 18th-century America, especially in Philadelphia. Also called a "Patron Saint of America", Tamenend represented peace and amity. A Tammany society founded in Philadelphia holds an annual Tammany festival. Tammany societies were established across the United States after the American Revolutionary War, and Tammany assumed mythic status as an icon for the peaceful politics of negotiation. 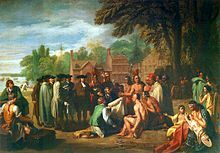 Tamanend reputedly took part in a meeting between the leaders of the Lenni-Lenape nation, and the leaders of the Pennsylvania colony held under a large elm tree at Shakamaxon in the early 1680s. William Penn and Tamanend continued to sign seven more documents assuring each other, and their peoples, of peaceble understanding after the initial one in 1683. Tamanend is recorded as having said that the Lenni-Lenape and the English colonists would "live in peace as long as the waters run in the rivers and creeks and as long as the stars and moon endure." These words have been memorialized on the statue of Tamanend that still stands in Philadelphia. It is believed that Tamanend died in 1701. Over the next century, many folk legends surrounded Tamanend, and his fame assumed mythical proportions among the people of Philadelphia, who began to call him "King Tammany," "Saint Tammany," and the "Patron Saint of America." The people of Philadelphia organized a Tammany society and an annual Tammany festival. These traditions soon spread across America. Tammany's popular status was partly due to the desire by colonists to express a distinct "American" identity, in place of their former European nationalities. Tammany provided an apt symbol for this kind of patriotism. Because of Philadelphia's prominence during the American Revolution and subsequent decades, Tammany soon became a national symbol throughout much of the newly formed country. Tammany Hall on East 14th Street in Manhattan featured a white marble statue of Tamanend (located in the arch on top of the building). Click on the image for a larger view. In 1772, the original Tammany Society was formed in Philadelphia (it was originally called the "Sons of King Tammany" but was later renamed the "Sons of St. Tammany"). Soon, Tammany societies were organized in communities from Georgia to Rhode Island, and west to the Ohio River. The most famous of these was New York City's Society of St. Tammany, whose members developed an influential political machine known as " Tammany Hall." A white marble statue of Tamanend adorned the façade of the building on East 14th Street that housed Tammany Hall. By the early 1770s, annual Tammany Festivals were being held in Philadelphia and Annapolis. The festivals were held on May 1, replacing the May Day traditions of Europe but continuing popular folk traditions. For example, the Saint Tammany Day celebrated on May 1, 1771, in Annapolis had a may pole decorated with ribbons. People danced in American Indian style to music while holding a ribbon and moving in a circle around the pole. On May 1, 1778, General George Washington and the Continental Army held a Tammany festival while camped at Valley Forge. The "men spent the day in mirth and jollity...in honor of King Tammany" (Military Journal of George Ewing, 1928). After the end of the Revolutionary War, Tammany celebrations spread throughout the United States, including to Savannah, Georgia. Local societies promoted annual festivals, usually held on May 1. Tammany celebrations were such important events that, in 1785, George Washington appeared at the Tammany festival in Richmond, Virginia with Virginia governor Patrick Henry. The Tammany Society in New York City held its first festival in 1787. A statue of an American Indian identified as Tamanend is shown outside Tammany Hall in the film Gangs of New York (2002). The musician Joanna Newsom, in the song 'Sapokanikan' from her 2015 album Divers refers to both King Tamanend and Tammany Hall. 42nd New York Infantry Monument, Gettysburg Battlefield. Tamanend, an 1817 wooden sculpture by William Luke, was the figurehead of the warship USS Delaware (1820). The ship burned during the American Civil War, but the figurehead was rescued and put on display at the United States Naval Academy in Annapolis, Maryland. In the 1930s, a bronze replica was installed on campus in front of Bancroft Hall, where each day the Brigade of Midshipmen forms the Noon Meal Formation. The midshipmen later renamed the bronze replica for " Tecumseh," a Shawnee leader, and the area surrounding it is now called "Tecumseh Court." The original figurehead is in the U.S. Naval Academy Museum. Tamanend, a 1995 bronze statue by Raymond Sandoval, is located at the intersection of Front and Market Streets, in Philadelphia, Pennsylvania. The plaque notes that "Tamanend was considered the patron saint of America by the colonists prior to American Independence." St. Tammany Parish (established c.1810) is one of nine Louisiana parishes (counties) named for "saints;" it is the only one whose namesake is not a Christian "saint" as recognized by the Roman Catholic Church. Mount Tammany is the name of the prominence on Kittatinny Mountain on the northeast (New Jersey) side of the Delaware Water Gap. "Tammany Regiment" was the nickname of the New York 42nd Infantry during the American Civil War. Its monument on the Gettysburg Battlefield includes an 1891 statue of Tamenend by John J. Boyle. Tamanend Middle School, Central Bucks School District, Pennsylvania, was named for him. St. Tammany Masonic Lodge #5, was chartered in Hampton, Virginia in 1759. ^ Lyman H. Butterfield, ed., Adams Family Correspondence; Cambridge: Harvard University Press, 1963-1973, II, pp. 229–230. ^ "St. Tammany Farm". www.sttammanyfarm.com. Retrieved 2017-07-08. "Tammany" . Appletons' Cyclopædia of American Biography. 1889. "Tammany Society" . The Nuttall Encyclopædia. 1907.